The Sales Training programs created by MULTI DIMENSION CONSULTANTS are all specific to the needs of each of its clients and for each of the training interventions. Our rich and relevant experience in training makes it easy to develop programs that are most relevant to our client's needs. 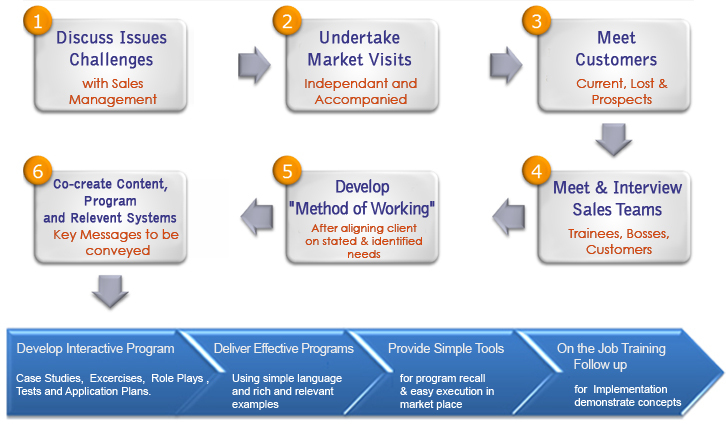 In effect, we partner with our clients to "Build Their Business"
All our programs are purely business-focused yet extremely simple to understand and easy to implement. Our clients benefit from both immediate as well as long-term results. see a "distinctly visible change" in the quality of Sales Personnel trained by us. These are not mere tall claims by us, but our clients stand testimony to these words. The strength and quality of our training programs have helped us retain clients for longer periods of time and given us further opportunities to engage with them, to participate in growing their business. These engagement opportunities have also helped us enrich our own knowledge and skillsets by getting first-hand understanding of our clients business, industry and way of working. This enrichment helps us in adding value to our subsequent training assignments by passing on the benefit of our learning to all our customers. The customers thus get to benefit from both company and industry level best practices.